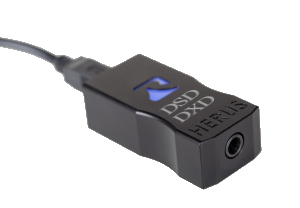 HERUS is our smallest form-factor, audiophile quality USB to Headphone DAC. It uses the USB Audio 2.0 Asynchronous protocol and supports DSD64 and DSD128 as well as high data rate PCM at 24bits up to 352.8Ks/S. It is a USB powered device that achieves more than 100dB of SNR, (typically 108dB) and is capable of driving 2.4V RMS, (ie 6.8V pk-to-pk) into headphones from 600 Ohms to 32 Ohms. The distortion in all cases is better than 0.005% (85dB): the measured THD+N is typically 89dB for 32 Ohms and 90dB (about 0.003%) for 600 Ohms. The HERUS+ is our latest version of HERUS, it meets all the specifications of the HERUS but now includes a user selectable, on-the-fly, choice of two up-sampling filters. The first custom up-sampling filter the Apodizing Filter, the second is the Minimum Phase IIR filter. Please refer to our note on Digital Filters for more details. Here is how it works: just plug the HERUS+ into your music source; IPad, IPhone, Android, MSWindows etc, and HERUS+ is recognized and powered up. HERUS+ looks and behaves just like the HERUS at power up. But unlike the regular HERUS, HERUS+ has a slightly raised “R” logo. Gently press and release the logo and the color will switch from Blue to Magenta. You have just engaged the first alternate up-sampling Apodizing filter. Press and release again, the logo remains Magenta, but the second up-sampling filter, the Minimum Phase IIR, is now engaged. Press and release a third time and the logo goes back to Blue, indicating you are now back to the nominal un-specialized up-sampling filter.